Goals from Davy Byrne and Ted Furman in either half helped Ballymun Kickhams to a surprisingly comfortable AIB Leinster club SFC quarter-final victory over Mullingar Shamrocks at Cusack Park this afternoon. Shamrocks dethroned Leinster champions Garrycastle after a replay to capture their first Westmeath SFC title in 12 years a fortnight ago, but proved no match for the rampant visitors who had outstanding performers in full back Philly McMahon, midfielder James McCarthy, Dean Rock and goal-scorer Furman. Speaking on Midlands 103 afterwards, former Shamrocks and Meath star Bernard Flynn accused the Lake County representatives of lacking ambition and labelled their performance as "embarrassing". 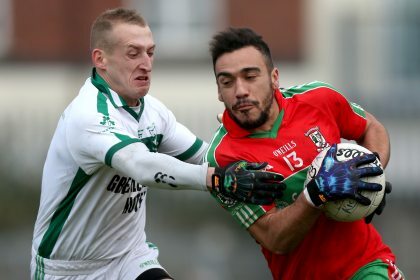 Paul Curran's impressive Ballymun side signalled their intentions by racing into a 0-4 to 0-0 lead after 10 minutes thanks to three Rock frees and another point from Furman, which clipped the crossbar. The Dublin kingpins underlined their superiority when Davy Byrne netted in the 12th minute and they went on to lead by 1-5 to 0-0 at the end of a one-sided opening quarter. Seanie Daly eventually opened Shamrocks' account from a free, but they still went into the break trailing by seven points, 0-3 to 1-7. Furman ended the game as a contest two minutes after the restart when grabbed the visitors' second goal. Shamrocks had to wait until the 46th minute for their first score from play as the 'Mun cruised to a 12-point victory and a place in the semi-final against Kildare champions Sarsfields in two weeks' time. On this evidence, they will take some stopping. Ballymun Kickhams - S Currie; Enda Dolan, P McMahon, Eoin Dolan; A Hubbard, K Connolly, J Burke; Davy Byrne (1-0), J McCarthy; E Reilly, K Leahy (0-1), J Whelan (0-2); T Furman (1-2), D Rock (0-8), A O' Brien. Subs: Derek Byrne for O' Brien, J Small for Whelan, F Andrews for Furman, J Welby for Burke, S Forde for Davy Byrne. Mullingar Shamrocks - R Tyrrell; E Moore, K Gavin, A Purcell; M Curley, D Gavin, K Daly; D Corroon, D O'Donoghue; P Joyce, S Daly (0-1), J Ganley; S Quinn, C Curley (0-3), L Smyth (0-1). Subs: A Clinton (0-1) for Daly, D Daly (0-1) for Quinn, A Smyth for Ganley, C O'Leary for O'Donoghue, P Christie for Moore.